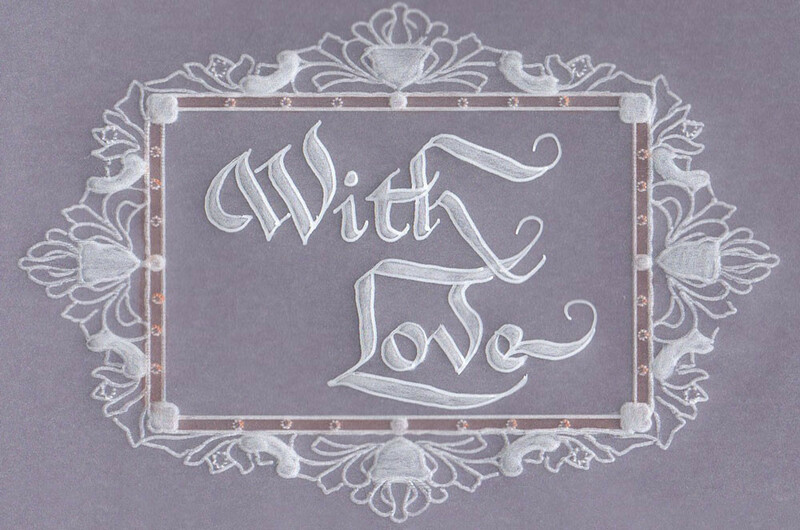 Use PCA Easy Embossing Templates to make embossed frames and decorative corners in many different designs. A PCA Template is an extremely flexible addition to your craft equipment. Four great corner designs to be used as either embossing and or perforating. Perforate using your PCA UniFine tool in combination with your Fine Oct Tool and Fine Leaf tool (depending on template). NOTE: if you choose to emboss the holes on this template, we recommend that you choose your PCA E3002 Small Ball Tool. Use to make a special corner or rotate and create a border or frame. Simply slide your paper along the design. Two great corner designs to be used as either embossing and or perforating. Perforate using your PCA Unibold tool in combination with your Bold Oct Tool and Bold Quad tool (depending on template). The Snowflake template uses the Bold Quad so that you can easily cut crosses. The Bow template uses the Bold Oct tool. Emboss using your PCA-E3012 Micro Ball tool. NOTE: if you choose to emboss the holes on this template, we recommend that you choose your PCA E3003 Medium Ball Tool. EasyEmboss Ruffled Starry Frame Template. Designed for use with the new Fine triangle perforating tools or simply just the UniFine. Emboss or perforate and achieve wonderful results. This templates allows you so many options. Just up to your imagination. Mix and match with other PCA templates / inserts. Emboss using your PCA-E3012 Micro Ball tool. This template offers two A6 size images, but can easily be added to any card to create a special larger greeting card. Mix and match with other PCA templates / inserts. Emboss using your PCA-E3012 Micro Ball tool. EasyEmboss Corners - 4 Template has four different designs. Create borders up to almost any size. Just simply slide your paper along the frame to create the size you require. Emboss using the PCA® MICRO BALL E3012 Tool. Suggested tip when embossing the leaves and diamonds. Start with a PCA-E3003 Medium ball or similar. Lightly emboss a straight line through the centre of each leaf or diamond. Once completed, finish embossing using your PCA-Micro Ball. A clear sharp embossing result is easily achieved with excellent depth. TP3446E EasyEmboss Dotty Frames - 3 template. Another addition to our large range of frames. Open to the imagination. Emboss or perforate. Add images and words from other templates. (Mix & Match) Emboss using your PCA-E3012 Micro Ball tool. EasyEmboss Lace mesh Corners template. An addition to our range of Fine mesh Lace templates. Use in conjunction with these templates or just as a decorative corner piece on those special cards. Add images and words from other templates. (Mix & Match) Emboss using your PCA-E3012 Micro Ball tool. Very easy with excellent results. 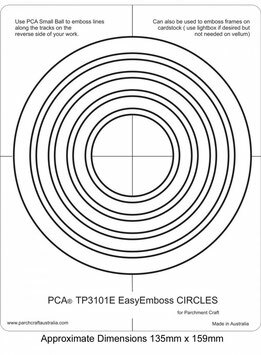 PCA Easy Embossing Template Circles. Using PCA small ball tool to emboss simply place the parchment over the templates and follow the frame lines. PCA recommend lubricating the parchment with a tumble dryer sheet before embossing. PCA Easy Embossing Template Ovals. Using PCA small ball tool to emboss simply place the parchment over the templates and follow the frame lines. PCA recommend lubricating the parchment with a tumble dryer sheet before embossing. 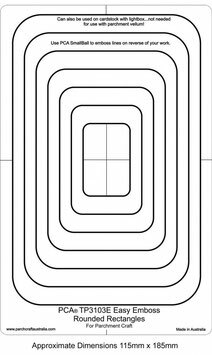 PCA Easy Embossing Template Rounded Rectangles. Using PCA small ball tool to emboss simply place the parchment over the templates and follow the frame lines. PCA recommend lubricating the parchment with a tumble dryer sheet before embossing. PCA Easy Embossing Template Oval Scallop Frames. Using PCA small ball tool to emboss simply place the parchment over the templates and follow the frame lines. PCA recommend lubricating the parchment with a tumble dryer sheet before embossing. 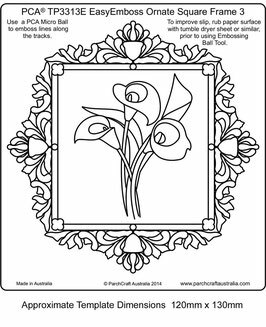 PCA Easy Embossing Template Rectangle Picture Frames. Using PCA small ball tool to emboss simply place the parchment over the templates and follow the frame lines. PCA recommend lubricating the parchment with a tumble dryer sheet before embossing. PCA Easy Embossing Template Ribbon Frames and Bow. Using PCA small ball tool to emboss simply place the parchment over the templates and follow the frame lines. PCA recommend lubricating the parchment with a tumble dryer sheet before embossing. Easy embossing template, Faux Running Stitch Ovals. Use a PCA small ball tool and this template to create pretty 'sewn' oval shapes. Simply place the parchment over the template and follow the lines with a ball tool. PCA recommend lubricating the parchment with a tumble dryer sheet before embossing. 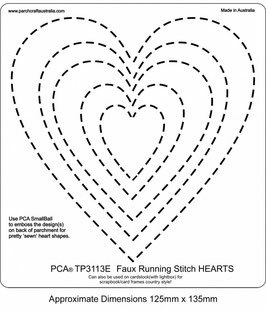 Easy embossing template, Faux Running Stitch Hearts. 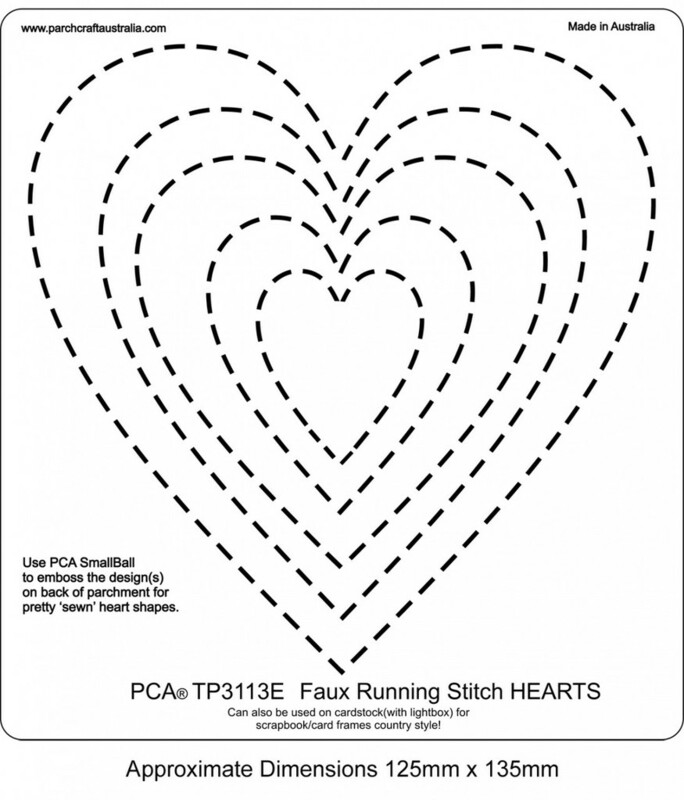 Use a PCA small ball tool and this template to create pretty 'sewn' heart shapes. Simply place the parchment over the template and follow the lines with a ball tool. PCA recommend lubricating the parchment with a tumble dryer sheet before embossing. A stunning modern Rectangular frame made up of different size dots that create one beautiful frame for Embossing using the PCA® Ball Tools in graduated sizes from Small to Large. 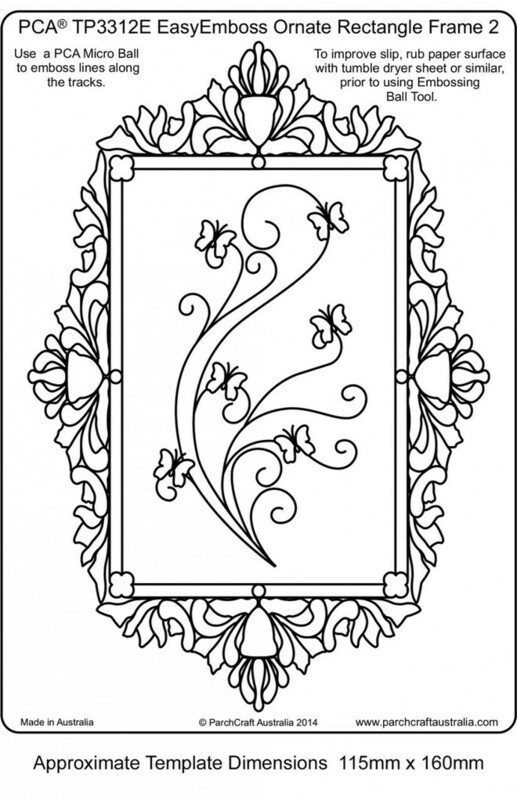 This looks amazing with a simple graphic or photo within ... for parchment or in scrapbooking. A clear sharp embossing result is easily achieved with excellent depth. Very quick and easy to use. Easy embossing template, Rope Circle Frames. Use a PCA small ball tool and this template to create a beautiful frames for your designs. Simply place the parchment over the template and follow the lines with a ball tool. PCA recommend lubricating the parchment with a tumble dryer sheet before embossing. A striking Sunburst patterned frame for Embossing using the PCA® Small Ball Tool. Also has some holes for perforating using the PCA® UniBold Tool. Alternatively, these holes may also be embossed using the Small Ball Tool. This frame looks amazing as a finishing touch to a beautiful parchment craft image... or to surround a special photo in a scrapbook for example. 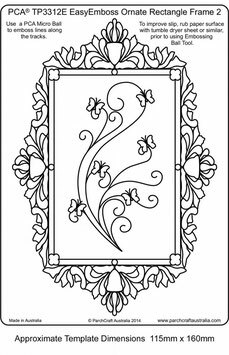 Easy embossing template, Ornate Frames 1. Use a PCA small ball tool and this template to make a beautiful frame for your designs. Simply place the parchment over the template and follow the lines with a ball tool. PCA recommend lubricating the parchment with a tumble dryer sheet before embossing. Simple but oh so handy! A series of different diameter Circles with Scalloped edges for Embossing using the PCA® Small Ball Tool. The perfect frame(s) ... alone or nested and decorated and filled as desired. A clear sharp embossing result is easily achieved with excellent depth. Very quick and easy to use. Easy embossing template, Easy Card Base, Central Strip and picture Frame. Use a PCA small ball tool and this template to make a quick easy card for your designs. Simply place the parchment over the template and follow the lines with a ball tool. PCA recommend lubricating the parchment with a tumble dryer sheet before embossing. A Square card base for you to start with that emulates a quarter paned window! Emboss using the PCA® Small Ball Tool. Finish the card by adding your own embellishments or perforations and add a greeting using a Word template to the label element of the template ( or leave label embossing OFF and decorate each quarter separately) Use an outdoor scene .... or simply decorate each section with different gridwork techniques, crosshatching., lattice perforations or even Stamping! Easy embossing template Scalloped Rectangle Frames. Use a PCA small ball tool and this template to create a beautiful frames for your designs. Simply place the parchment over the template and follow the lines with a ball tool. PCA recommend lubricating the parchment with a tumble dryer sheet before embossing. PCA Easy Card Base Hexagonal Segments. Use a PCA small ball tool and this template to create a beautiful hexagonal card on which to create your own designs. Simply place the parchment over the template and follow the lines with a ball tool. PCA recommend lubricating the parchment with a tumble dryer sheet before embossing. A romantic Lacy Heart frame for your cards or scrapbook pages! Emboss using the PCA® Small, Medium and Large Ball Tools as per instructions on the template. Smooth any larger embossed dots/areas with Large Ball after removal from template if desired. Finish card by adding your own embellishments or perforations etc. 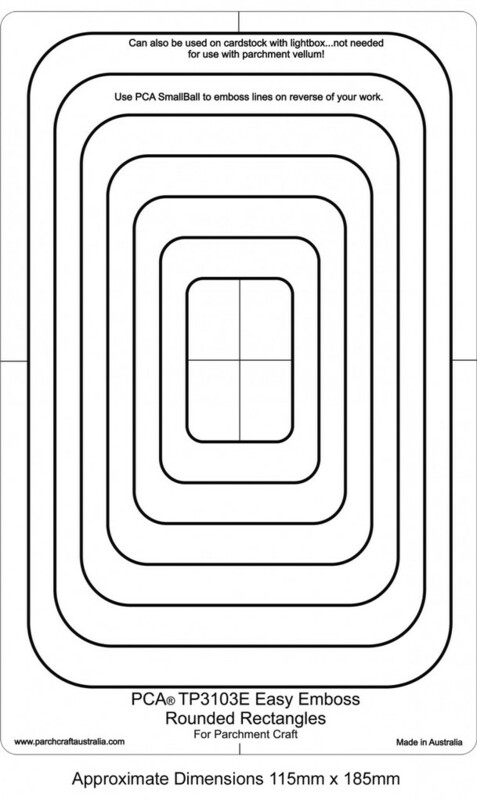 This template has four different decorative corners to make cards with. Emboss using the PCA Small Ball Tool. You can smooth out any larger areas of embossing (or larger dot centres) with a Large Ball after removal from template if desired. Perforate as per instructions on the template using the PCA UniBold Tool. The modern dot swirls and curls on this template are slightly larger than the Fine variety and make a beautiful statement of finesse on so many of your projects. They lend a finishing touch that is very popular! You can emboss from both front and back of the template, using part of and any combination of swirls on the template. Used randomly they can make so many variations! Emboss using the PCA® Small/Medium Ball Tool. A clear sharp embossing result is easily achieved with excellent depth. These modern swirls and curls are ideal to add that touch of finesse to your projects! They are slightly smaller and so able to be both accurately embossed and/or perforated and used either from front or back of template, so you have many ways and directions of facing that you can utilise with them. You simply line up whereever you wish them to be and emboss/perforate in any combination or part thereof to get the shape and size you want. Emboss using the PCA® Small Ball Tool and perforate with the PCA® UniBold or UniFine. This is the second template with four different decorative corners to make cards with. This one includes a Romantic corner with hearts, a Regal Fleur/spear, a Christmassy Holly corner and a Springlike Corner for all occasions. Emboss using the PCA Micro Ball Tool. You can smooth out any larger areas of embossing (or larger dot centres) with a Large Ball after removal from template if desired. Perforate as per instructions on the template using the PCA UniBold Tool. PCA Easy Embossing Template Basic Squares. Using PCA small ball tool to emboss simply place the parchment over the templates and follow the frame lines. PCA recommend lubricating the parchment with a tumble dryer sheet before embossing. PCA Easy Embossing Template Basic Rectangles. Using PCA small ball tool to emboss simply place the parchment over the templates and follow the frame lines. PCA recommend lubricating the parchment with a tumble dryer sheet before embossing. This beautiful teardrop/floral frame can be used with your own centre motif, it is very versatile: the teardrops can be either cut out with the Fine MiniStampEdge or embossed. This particular frame can be used in 4 ways: you can emboss the entire design, use the two frames separately or just use the corners. Emboss using the PCA® MICRO BALL E3012 Tool. 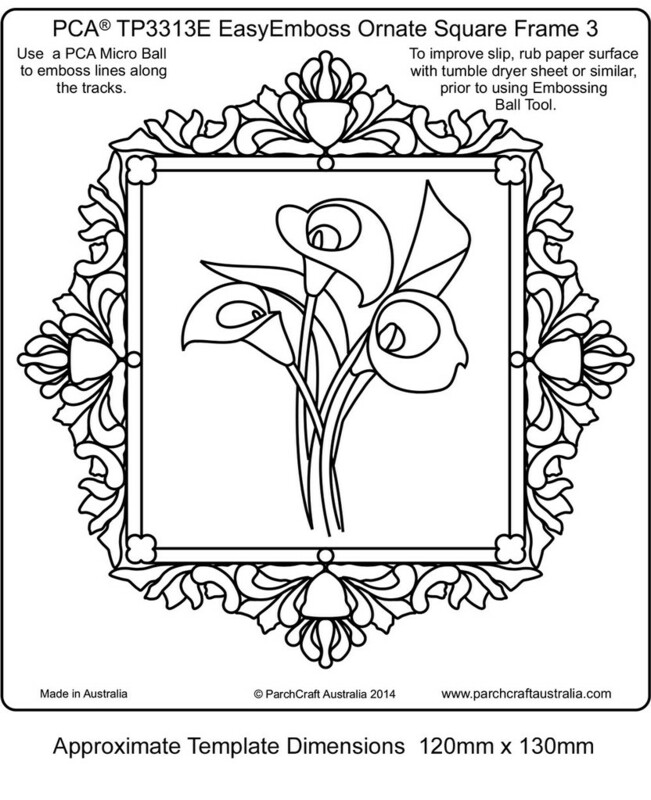 Easy embossing template, Swirly Frames. Use a PCA small ball tool and this template to make a beautiful frame for your designs. Simply place the parchment over the template and follow the lines with a ball tool. PCA recommend lubricating the parchment with a tumble dryer sheet before embossing. This delicate frame allows the end user to be very creative. PCA® suggest using the PCA-E3012 MicroBall tool to do the initial tracing of the template. Remember, you only need to emboss the areas desired. ie: simply emboss the actual frame and insert your own picture or words. 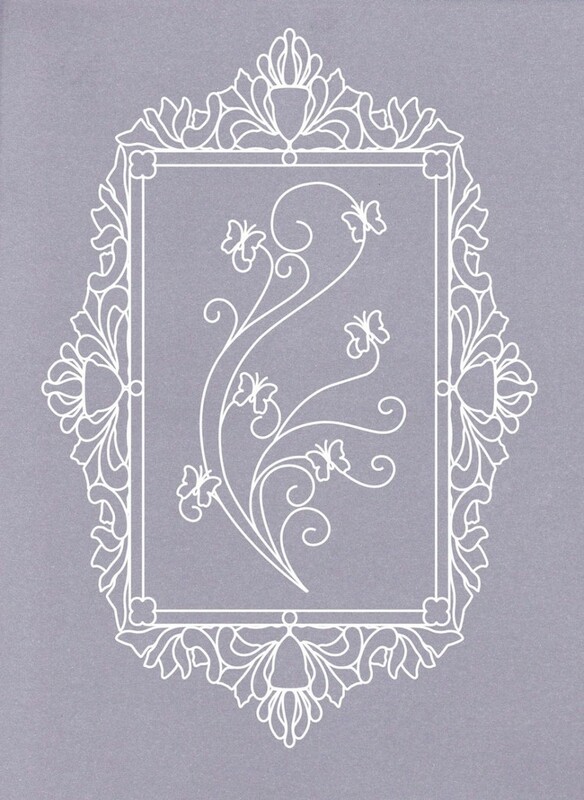 A beautiful frame template that can be embossed as a frame with or without the central motif. 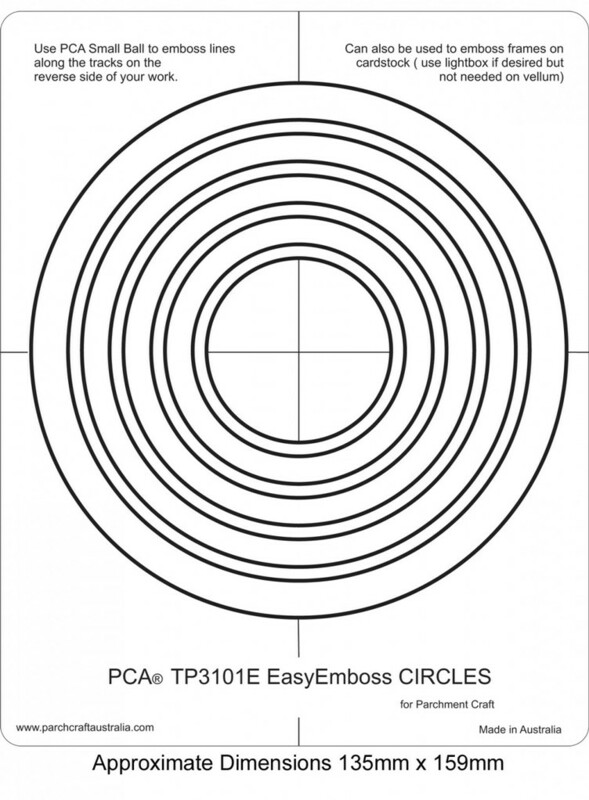 PCA® suggest using the PCA-E3012 MicroBall tool to do the initial tracing of the template. Remember, you only need to emboss the areas desired. ie: simply emboss the actual frame and insert your own picture or words. Combine more than one template to achieve that unique design. PCA have designed a template with two small frames. Ideal for those special small cards. (A6 = 1/4 Page) PCA® suggest using the PCA-E3012 MicroBall tool to do the initial tracing of the template. Remember, you only need to emboss the areas desired. ie: simply emboss the actual frame and insert your own picture or words. Mix & Match. Combine more than one template to achieve a unique design. Pretty Retro Broderie Anglaise style fabric inspired Rectangular Frame template. Emboss using the PCA® Small Ball Tool. Perforate using PCA® UniBold. Follow further instructions on template. Finish card by adding your own embellishments, suntool impressions or perforations etc.